As an adult I felt hopeless, lost in the “hell” of extreme weight gain. I knew how to lose weight by dieting, but I did not know how to keep it off. So I would lose and then, gain it back again plus more. It’s a horrible existence. When I was a kid I heard my mother and grandmother talking about how much weight I had gained and how they kept just having to buy me bigger and bigger clothes. “It’s like she can’t stop gaining weight,” my mother said. She was frustrated at having to buy me new clothes with a small budget. But this was the beginning of it. “I can’t lose weight” began to take root in me as a truth. I had allowed an emotion to become a core life value. The only way I can describe it is hopelessness. My mother and my grandmother’s words left me feeling hopeless. I accepted them as facts. I can’t lose weight. I’ll never be able to lose weight. All I do is gain weight. When the emotion of hopelessness over my situation would surface there would be only recourse for me. I would eat, preferably something made with sugar and flour, something like my grandmother would have made. I fed the emotion of hopelessness with the only thing I knew would quiet it and allow me to go about a somewhat normal state of emotions. It would anesthetize my pain for a short while. Then, I’d need more to get the same feeling. If this sounds like an addictive cycle, it is. I continued to do this throughout my life, through various trials and temptations, always giving in, never taking a stand. When I finally came to the end of myself and totally surrendered to what God had been telling me, my life transformed completely. The switch in my brain happened in an instant—the moment I recognized the truth. The truth is I can lose weight if I stop eating sugar. The reality of how to do this was the challenge. I was, and still am, like Paul. I have a weakness. 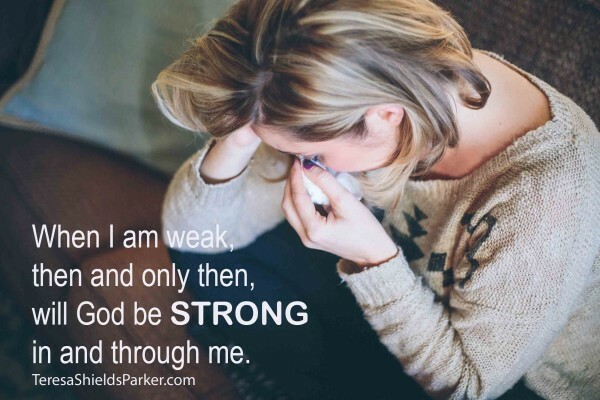 Scripture doesn’t tell us what Paul’s weakness was. It does tell us he asked God three times to remove it. Paul learned humanity has limitations. Those limitations, though, are not reasons to quit. They should lead us to understand, the weaker we get, the stronger we become2 when we rely totally on God’s strength instead of our own. My weakness for certain foods was there to help me understand I need to rely more fully on God. Instead, I took things into my own hands and made the mess bigger and bigger until I got to the point I knew beyond a shadow of a doubt, I couldn’t overcome the pull certain foods have on me without God’s help. As long as I was trying to do it on my own, I had rendered His power useless in my life. Is God strong all the time? Yes, He is. Why was His strength not activated in my life? His power is only made complete when I admit my weakness and abject poverty in this area. I was saying I needed help. In reality, the help I wanted was to keep doing what I was doing, eating what I wanted to eat and getting different results. This is the definition of insanity. I fully admit I was there. I was insane to think I could do the same thing and get different results. The first step in any radical change is to do something different. I wanted to keep everything the same, but lose weight. And I really wanted to lose weight. I had a lot of passion about it. I knew all the reasons. I knew the practicality behind it. I’d be eager to go on a diet. I’d have great resolve for the first day. Then, I would fail. Looking at the verses again, I saw it clearly. I had been looking in the wrong place. Acting in my own human strength, I will always be waffling. If I really understand the grace of God, I will understand His strength can’t operate when I’m acting self-sufficient, self-important, holier than even God. When I began to walk out what I knew was His plan, I felt His grace-wind at my back propelling me forward to health and wholeness. It’s a place from which I can minister. It’s a place from which I can complete my assignment here on earth. It’s a place from which I can live. 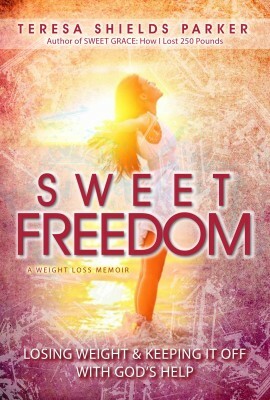 This is an excerpt from my new book, Sweet Freedom: Losing Weight and Keeping It Off With God’s Help. The book goes deeper into the emotional and spiritual journey of freedom from addiction of which food addiction is one of the worst. Some of the things I share in Sweet Freedom I swore I would never tell another living person. It’s available right now for pre-order and will be live February 15, 2016. I can’t wait for you to read it. I’m also working on a study guide to help work through your own emotional issues, which will most likely relate to spiritual issues, holding you back from being all you can be. Be careful, though, if you read it, it will lead you to your keys to freedom.